As you enjoy the holiday season, helping patrons and settling down with a good book yourself, let’s take a look back at some of the tips, trends, and opinions we shared with you this year! We’ll close with a glimpse of four major conferences we attended, too. Here is your 2018 Brodart Connect Year in Review. We brought STEAM titles into the spotlight with a look at several different benefits that STEAM programming offers. To make collection development easier on librarians, we offered two STEAM-centric title lists: a STEAM list for ages 3-14, and a STEAM list filled with biographies. Gwen Vanderhage took a closer look at the trends and reading habits driving today’s teens. She also highlighted diversity—reflecting the desire to see oneself in the material one is reading—and the search for identity that is guiding teens and influencing the publishing world every day. Check out this list of titles full of diverse experiences and characters for teens. In June, we gave you an inside look at the titles currently occupying Brodart employees’ bookshelves. From YA to Adult, these selections ran the gamut of fiction and nonfiction. Here's a list to refresh your memory – or add a few to your own shelves! Suzanne W. Hawley made the case for giving middle grade titles its own section on the shelf. She also treated readers to a closer look at the age ranges, mindsets, and content found in middle grade titles across the spectrum. Take a look at our Middle Grade Fiction Bibz List for some hot titles today. In September, we went beyond Game of Thrones to look at several TV series adapted from books—and vice versa. Of the roughly 500 series available on TV and streaming in 2017, we looked at newer adaptations, such as Elena Ferrante’s My Brilliant Friend and the Black-ish parenting guide. We also made sure to sprinkle in a few longstanding favorites. 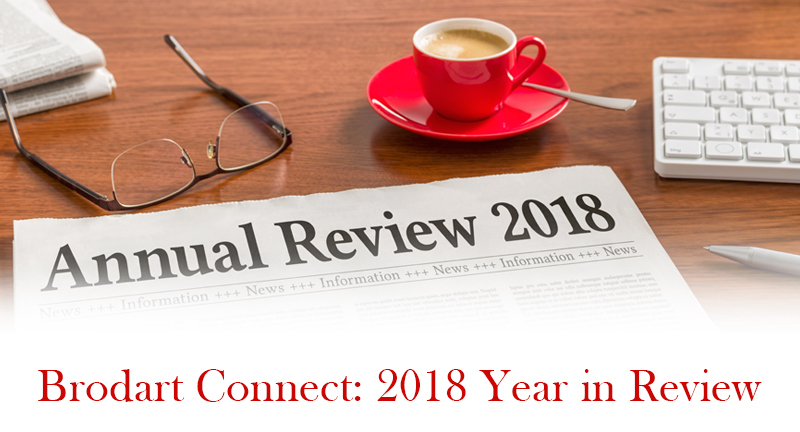 For more great stories from 2018 and years past, visit our Brodart Connect Archives. We inspired conference-goers with stylish seating options, some hot new STEAM products, collaboration tables, and more at ALA Midwinter in January. We also shared the many benefits of our expertly-selected Spanish book services and McNaughton® leasing programs. At the 2018 PLA conference, guest author Bryan Reardon signed copies of The Real Michael Swann at our booth, shared a few inspirations for the novel, and talked about what libraries have meant to him through the years. This year’s TLA conference brought Super Amoeba and Tales from the Locker author Jennifer Holm to our booth. In our Connect newsletter preview, she talked about libraries today and shared one of the things most enjoys about meeting young fans. She also revealed her own personal Super Amoeba. At ALA Annual in New Orleans this year, we shared some tricks of the trade to increase collection circulation. We also featured our new modular Geometrix furniture, as well as a 3D pen that conference attendees got to try out. We had such a great time sharing in 2018. Look for more exciting news and articles in 2019. Happy New Year!